Almost every smartphone company has launched a smartphone with lesser bezels or an 18:9 aspect ratio this year, but Sony is a brand that is still following the same design language that its phone had a couple of years back. There are people who love Sony’s design, but not everyone likes those big bezels on top and bottom and a large form factor despite having a smaller display. 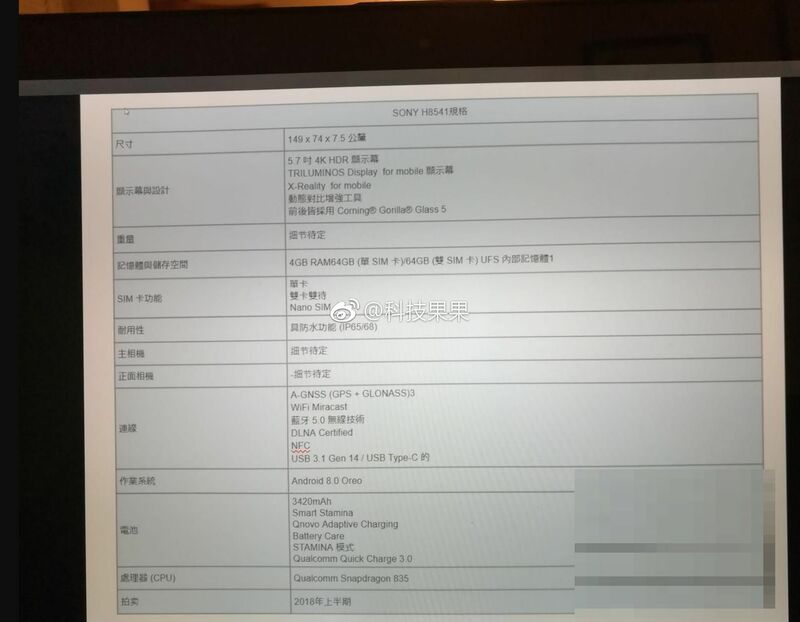 It seems like in 2018, the company is finally changing its design since the spec sheet of Sony H8541 has leaked which is supposed to be a bezel-less phone from the company. As per the source on Weibo, the phone will feature 5.7-inch 4K HDR Triluminous display with Gorilla Glass 5, and the phone’s dimensions are going to be 149x74x7.5 which show that the bezels are going to be lesser. We can expect to see 18:9 display on the phone. The Sony H8541 will come with Snapdragon 835 processor, 4GB RAM & 64GB ROM. There will be a 3,420mAh battery under the hood with Qnovo Adaptive Charging and Qualcomm Quick Charge 3.0. Android 8.0 Oreo will run out of the box, and other features include Bluetooth 5.0, NFC, USB Type-C, etc. The launch will take place in the first half of 2018 but the exact launch date or month is not known yet. Stay Tuned for more details.